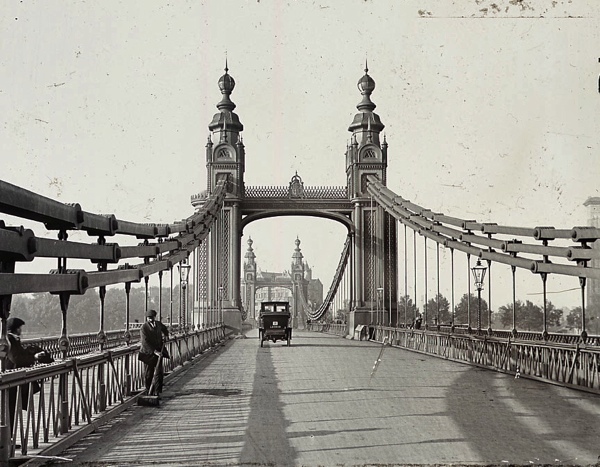 London owes its very existence to bridges, since the location of the capital upon the banks of the Thames was defined by the lowest crossing point of the river. 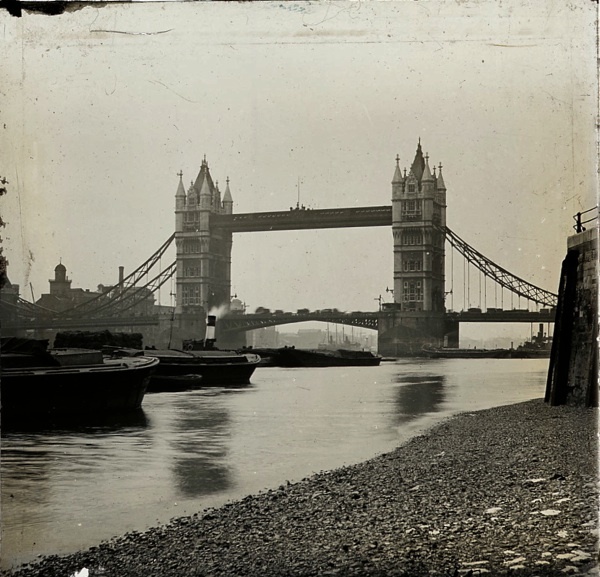 No wonder that the London & Middlesex Archaeological Society collected this edifying series of pictures of bridges on glass plates to use in their magic lantern shows at the Bishopsgate Institute. 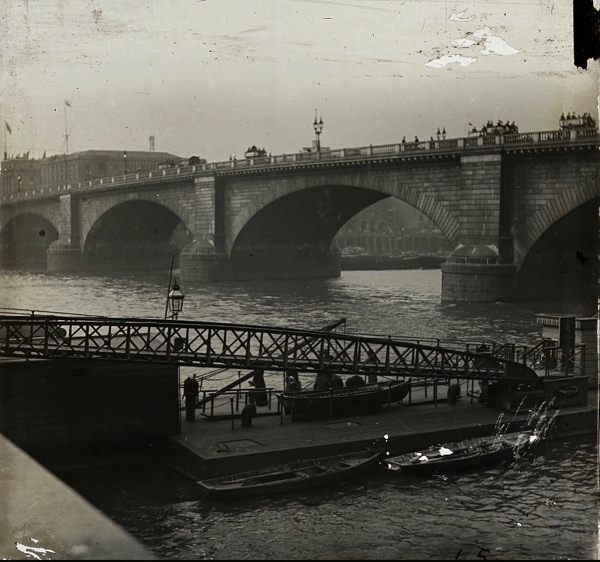 The first stone London Bridge was built by Peter de Colechurch in 1209 and lasted over six hundred years, surviving the Great Fire and numerous rebuildings of the houses and shops that clustered upon its structure. When traffic upon grew too crowded in 1722, a “keep left” rule was instated that later became the pattern for all roads in this country and, by 1763, all the houses were removed to provide extra clearance. 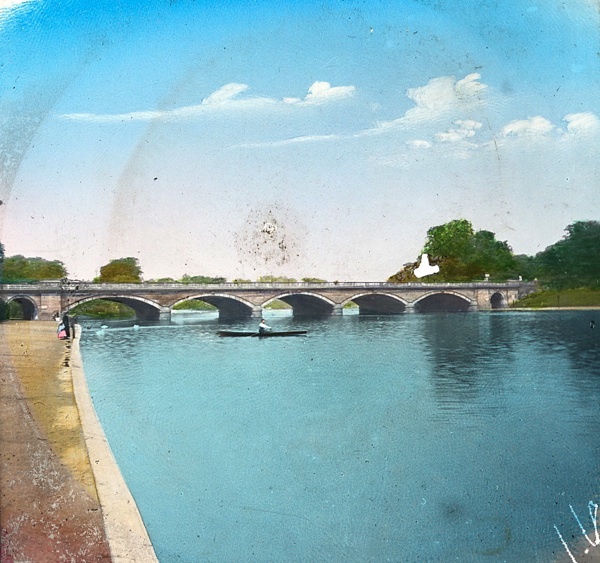 Then, in 1831, John Rennie’s famous bridge of Dartmoor granite replaced old London Bridge until it was shipped off to Arizona in the nineteen-sixties to make way for the current concrete bridge, with its centrally heated pavements and hollow structure that permits essential pipes and cables to cross the Thames easily. 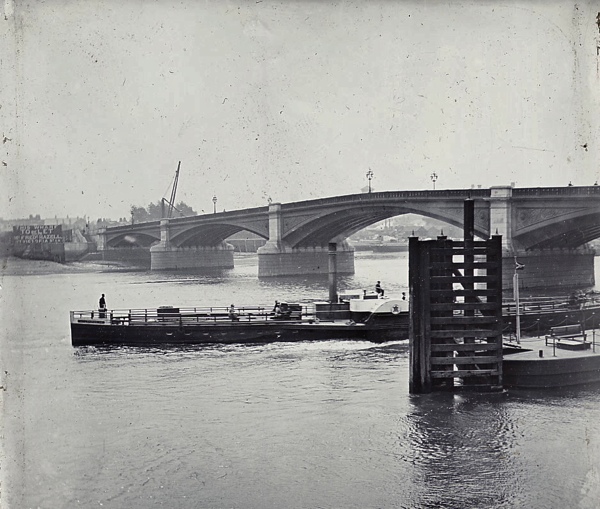 After London Bridge, next came Putney Bridge in 1726 and then Westminster Bridge in 1738 – until today we have a line of bridges, holding the north and south banks of London together tightly like laces on a boot. 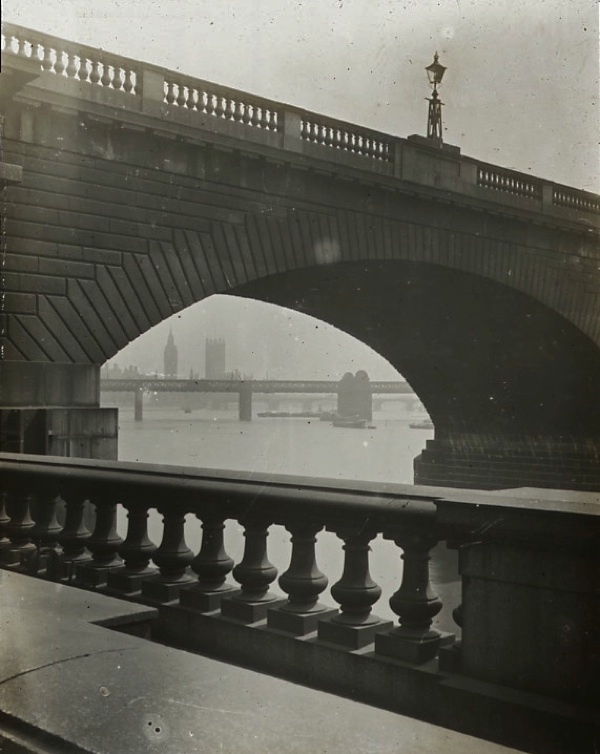 The hero of London’s bridges was unquestionably John Rennie (1761-1821) who pioneered the combination or iron and stone in bridge building and designed London Bridge, Waterloo Bridge, Southwark Bridge and Vauxhall Bridge, although only the Serpentine Bridge remains today as his memorial. 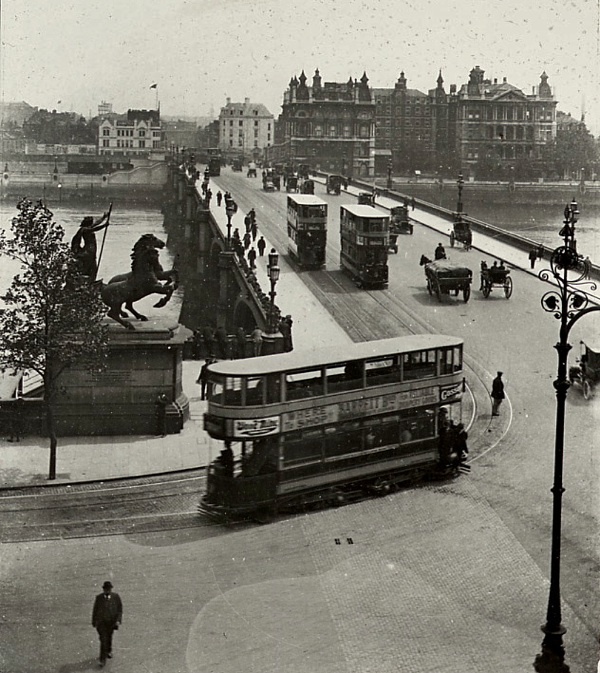 Even to the seasoned Londoner, there is something unfailingly exhilarating about sitting on top of a bus, erupting from the narrow city streets onto one of the bridges and discovering yourself suspended high above the vast River Thames, it is one of the definitive experiences of our city. 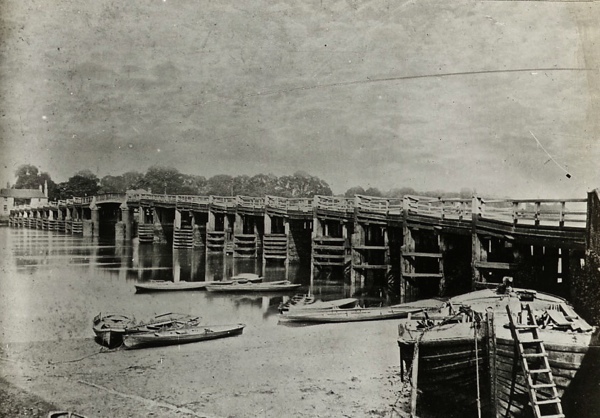 Old wooden bridge at Putney, 1880. 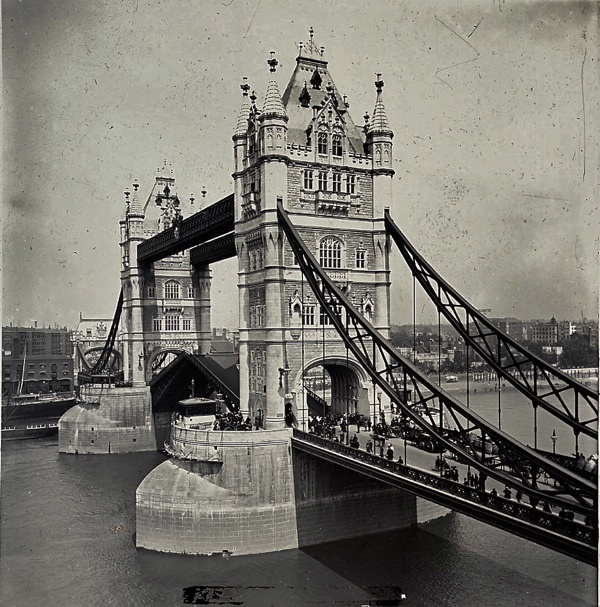 The second bridge to be built after London Bridge, constructed in 1726 and replaced by the current stone structure in 1886. 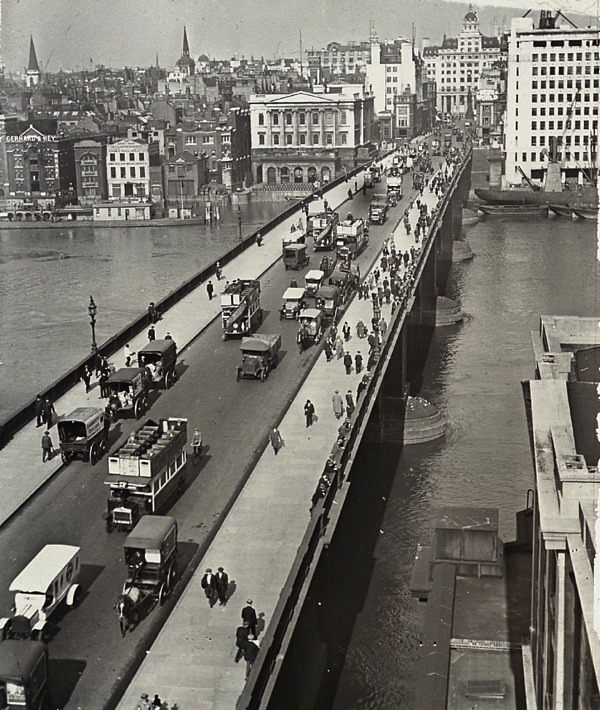 London Bridge, c. 1930. Sold to Robert Mc Culloch in 1968 and re-assembled in Arizona in 1971. 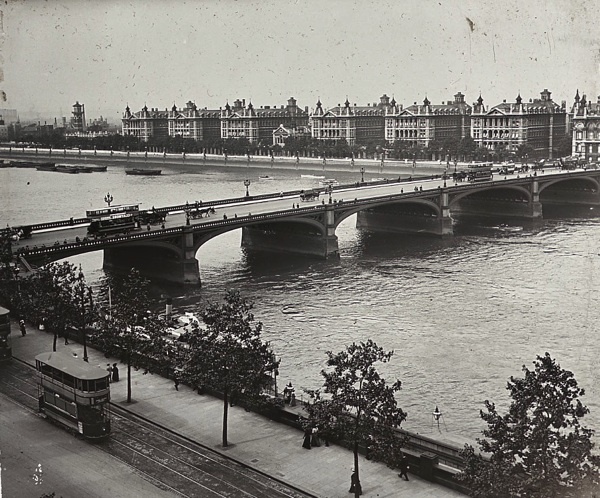 Waterloo Bridge, c. 1910. 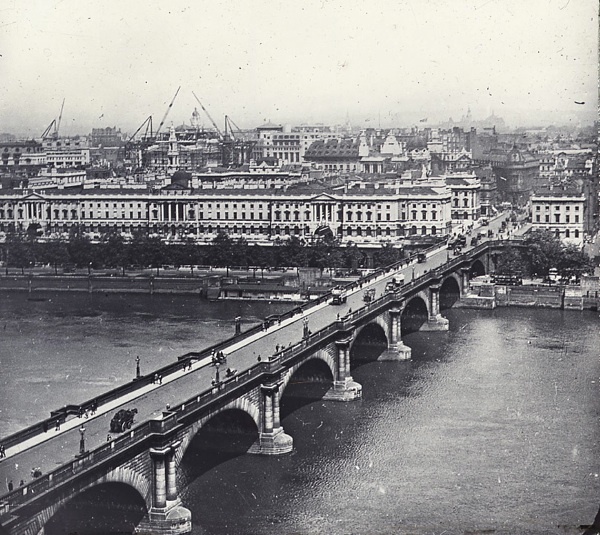 The increased river flow created by the demolition of old London Bridge required temporary reinforcements to Waterloo Bridge from 1884. 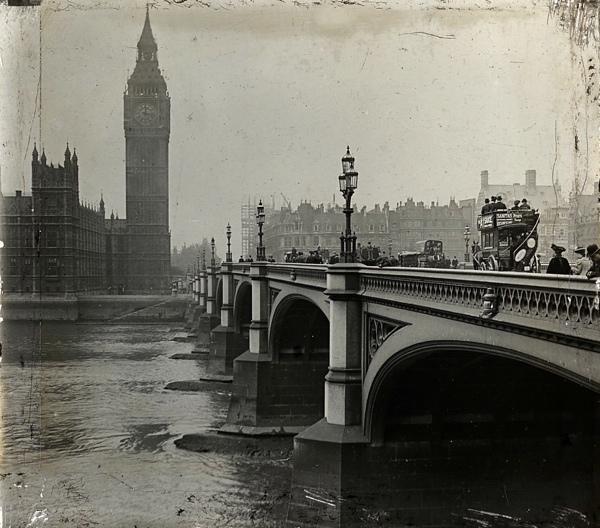 Westminster Bridge, c. 1910. 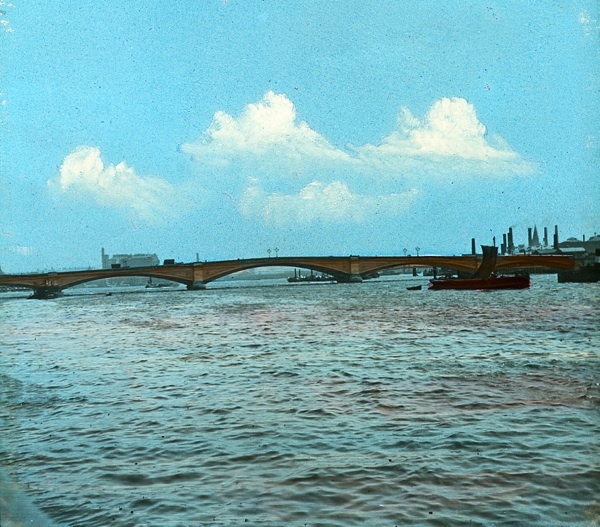 The third bridge, built over the Thames after London and Putney Bridges, in 1739-1750. 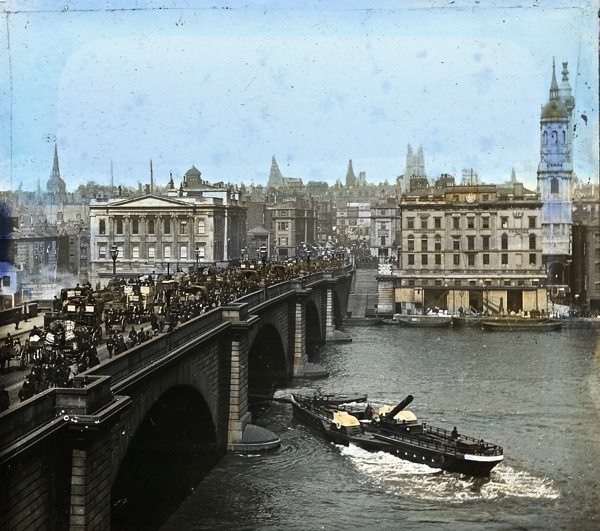 The current bridge by Thomas Page of 1862 is painted green to match the leather seats in the House of Commons. 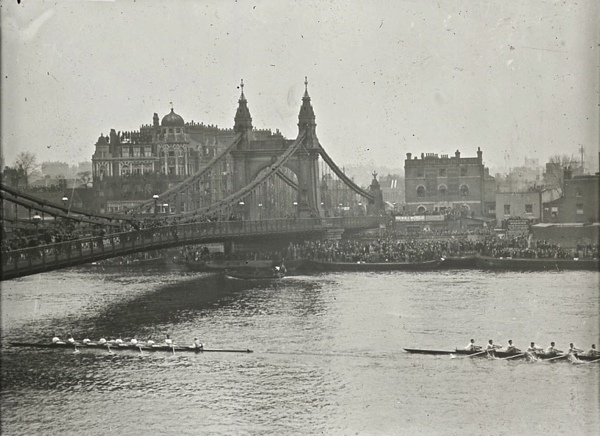 Hammersmith Bridge with Oxford & Cambridge Boat Race, 1928. 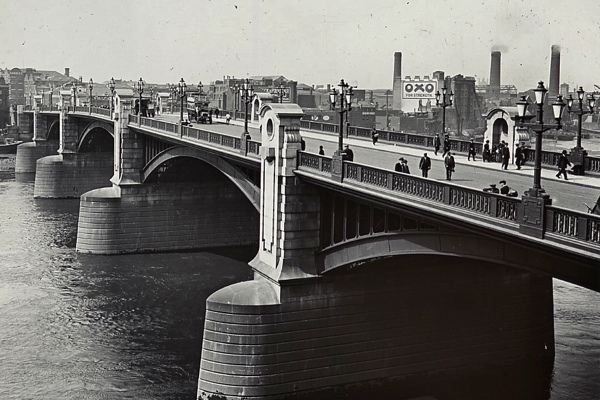 Dixon, Appleby & Thorne’s bridge was built in 1887. 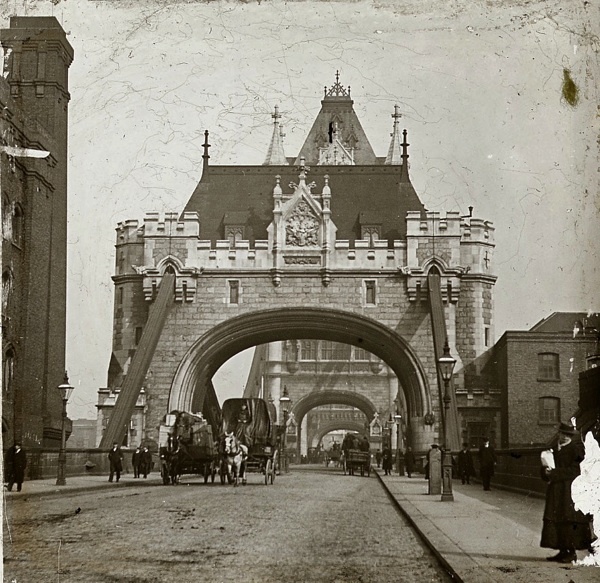 Battersea Bridge, c. 1910 Sir Joseph Bazalgette’s bridge was built in 1879. 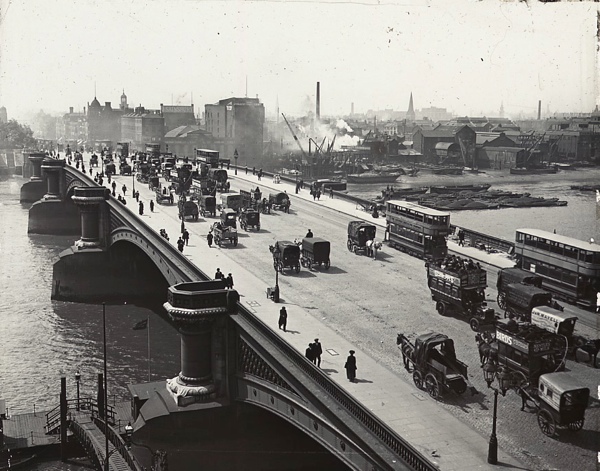 Cannon St Railway Bridge, c. 1910. 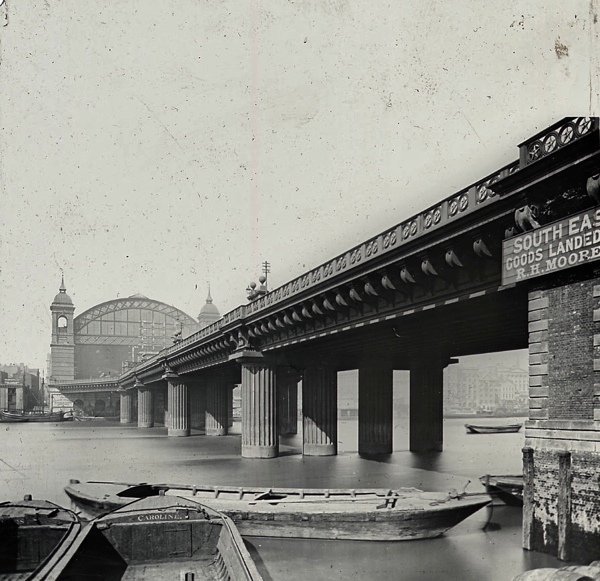 Designed by John Hawkshaw and John Wolfe-Barry for the South Eastern Railway in 1866. 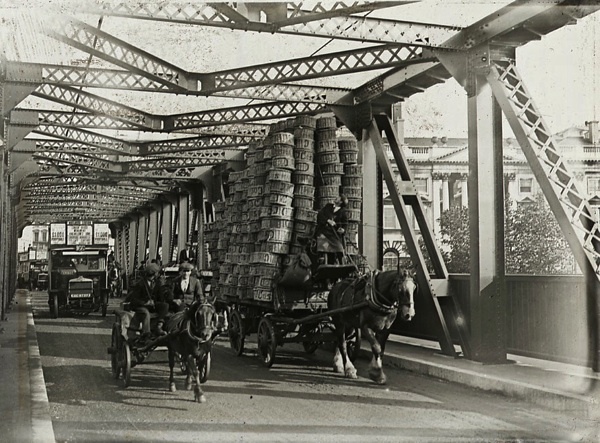 Serpentine Bridge, 1910. Designed by John Rennie in the eighteen-twenties. 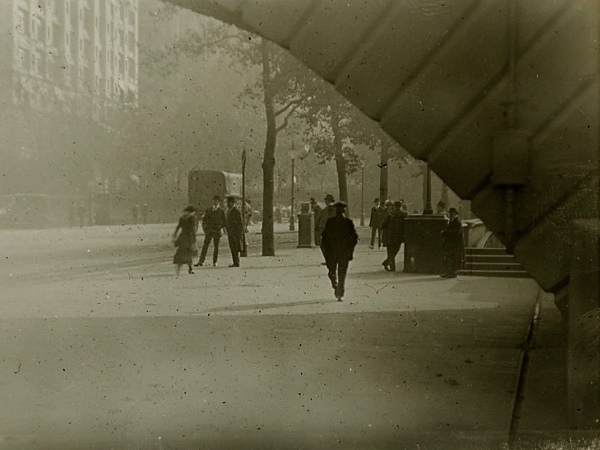 I love these Bishopsgate Institute images – and the posts that accompany. 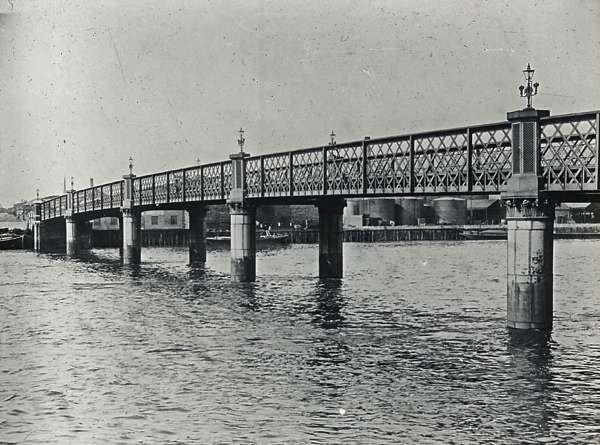 I did not know there was a Wandsworth bridge. Some of these images are confusing because they are reversed but still beautiful, especially the rare coloured picture. Keep going, GA. More, more! A fascinating piece as ever, particularly love the last pic of London Br in 1910 and the pleasure steamer with its funnel down to go under the arch. Pedantically, the image of Westminster Br 11th from the bottom must be reversed but feel free not to post this..! Fascinating stuff – I love this; so many memories. I lived in South London and went to school on the other side of the river so travelled across Hammersmith and Putney Bridges (including the tube one) on a regular basis. Hammersmith was always a problem because it is just one line of traffic each way and a double carriage road fed into it. It’s a lovely bridge, especially when viewed from the Dove with a pint in hand (a location often used in TV’s ‘New Tricks). My school’s cross-country course (a loose term in London) ran along each bank of the river between Hammersmith and Barnes Bridges so there was no scope for short-cuts! It’s also good to see you acknowledge Putney Bridge as the second bridge between London and Kingston – it’s often ignored. 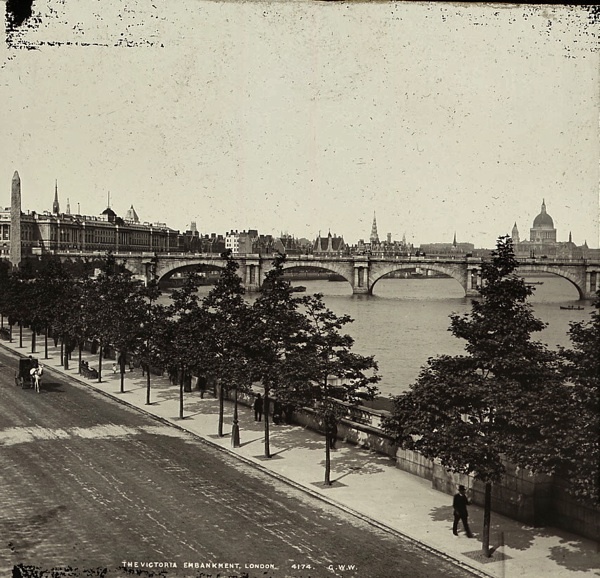 I think your 14th photo shows the ‘original’ Waterloo Bridge (by Rennie? 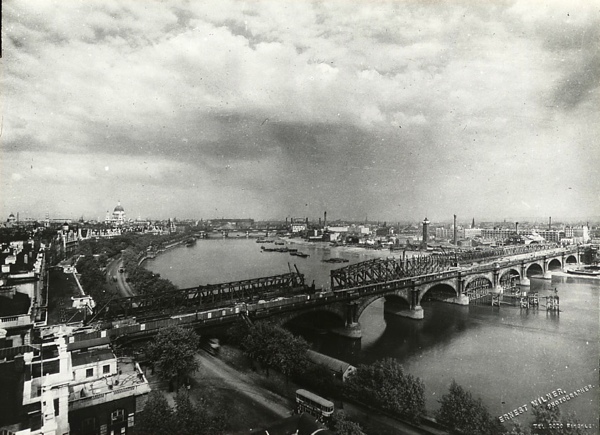 ), the 13th shows it with the temporary steel bridge going up alongside, the top (1st) photo shows the temporary steel bridge in use (1924-1942ish) .The current concrete bridge was completed by a labour force including many women during World War II and the steel sections from the temporary bridge re-used during the Allies advance through Northern Europe. 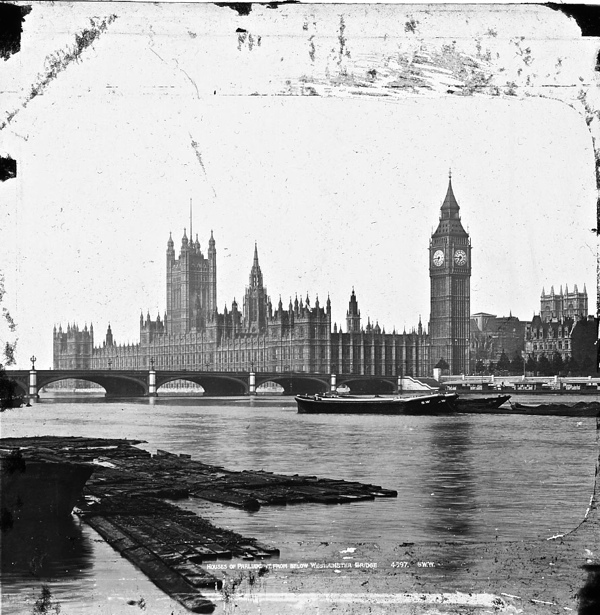 Wonderful glass plate views GA. 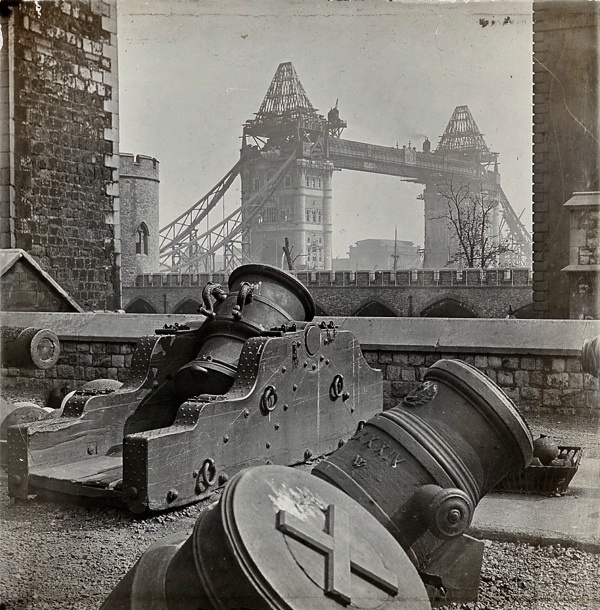 When I see photographs like these, I tend to picture the same view as if I was looking at it today, and consequently deciding if it is better or worse, generally with mixed results. 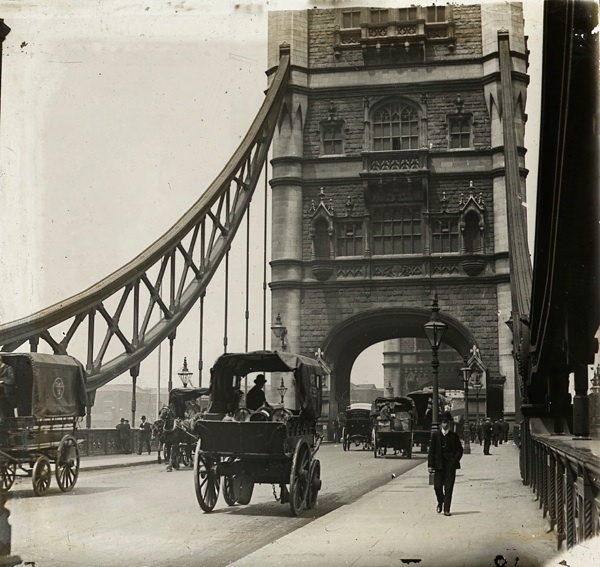 Although some of these photo’s have been reversed, they give us a different view of London. 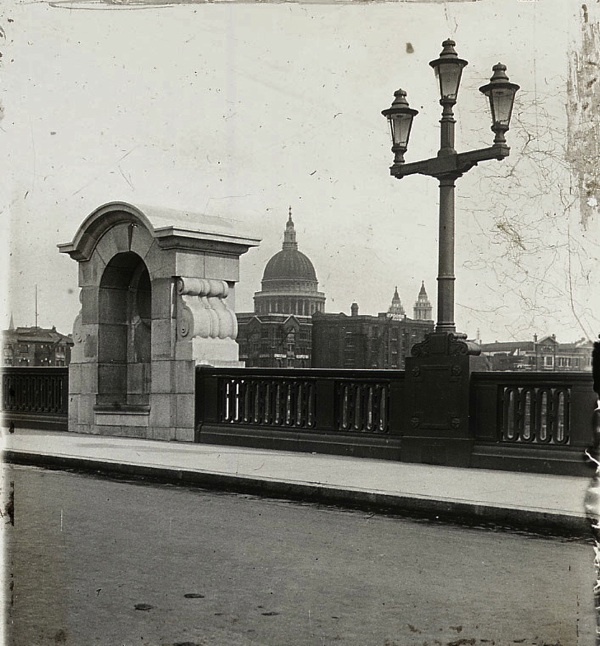 For example, the view of St.Paul’s from Southwark Bridge. The Cathedral has moved to a site close to where the Bank of England now stands, and the west towers have become the east towers! Some of these ‘reversals’ give us a fascinating alternative view. Lovely photos, The pleasure steamer is actually a paddle wheeler, and the photo would have been coloured by hand.